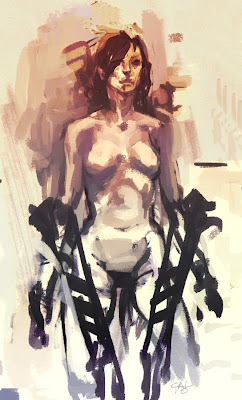 A random figure sketch. Just trying to loosen up. I haven't done anything even remotely related to figures or characters lately. 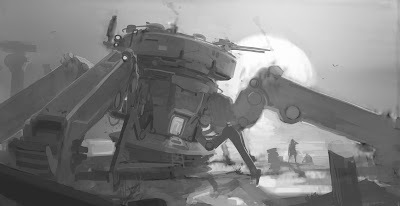 I evidently need more studies from life or ref. Life preferably. I tried bringing it a bit further in several directions, but finally resided it's not going anywhere and I should maybe rest for a bit from overdesining stuff and just enjoy the painting. 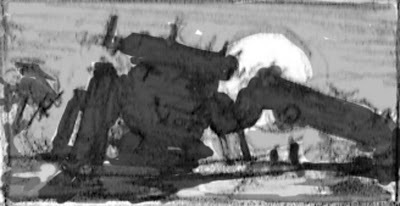 Part of series of experiments I started that include picking a really small photo thumbnail of random vehicle(car), with a pallet and overall perspective I like and using this as a starting point and building on top, whatever comes. 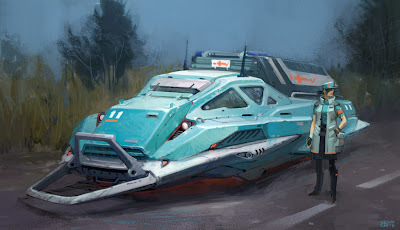 In general, turning old cars in a futuristic and some times retro-futuristic, armored vehicles in bright colors. If I get time to finish them expect me posting the rest of them in not so distant future. 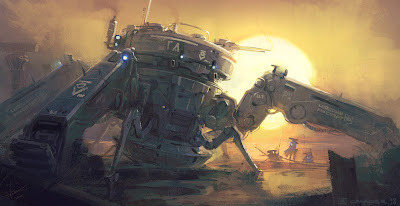 A derert patrol bot and its crew, meeting the sunrise. Shaded thumbnail, B/W sketch and final.